To Fly: The Story of the Wright Brothers by Wendie Old, illustrated by Robert Andrew Parker (Clarion Books, 2002). 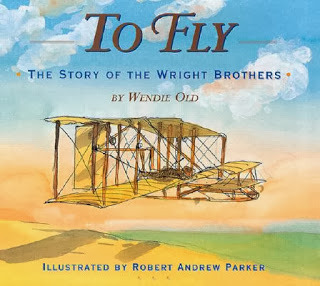 The Wright Brothers’ life story told throughout fifteen short chapters. It captures their fascination of flying and brings the majesty of it to life: beginning with their early years, their failed experiments, and ending with their successful flights in 1903. Bibliography, end notes, and timeline conclude this thoroughly researched biography. Using comic-book style art, this book takes readers on a journey of the two brothers who were determined to fly. NASA’s biography of Wilbur Wright has links to the invention process, researched flight, tested theories and other associated ideas.